This drink goes down anything but easy. 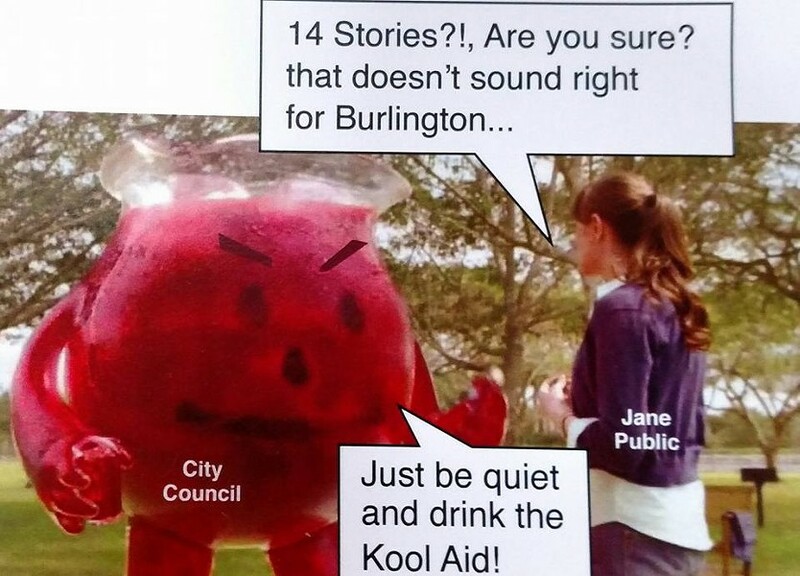 An unknown artist created a series of at least four satirical postcards using old Kool-Aid ads to mock Burlington Mayor Miro Weinberger and city councilors who are in favor of a zoning amendment that will allow developer Don Sinex to build up to 14 stories high. 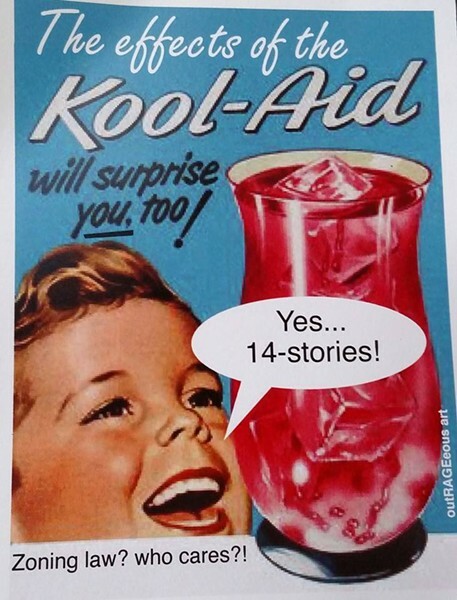 The altered ads were distributed at the South End Art Hop last weekend and were posted Sunday on the Facebook page belonging to the Stop the 14-Story Mall group. 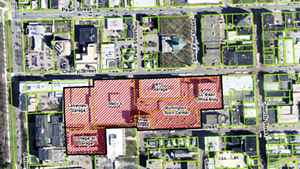 The post came one day before the council passed by a 7-4 vote the amendment that will allow the Burlington Town Center redevelopment to go forward. 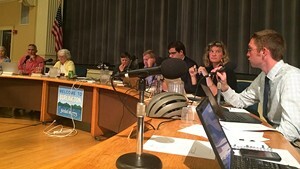 A public hearing and final vote on the proposal is scheduled for September 29. Genese Grill, another Coalition for a Livable City member, told Seven Days by email that someone anonymously dropped off the artwork outside the door of the 8 Space Studio Collective on Howard Street. 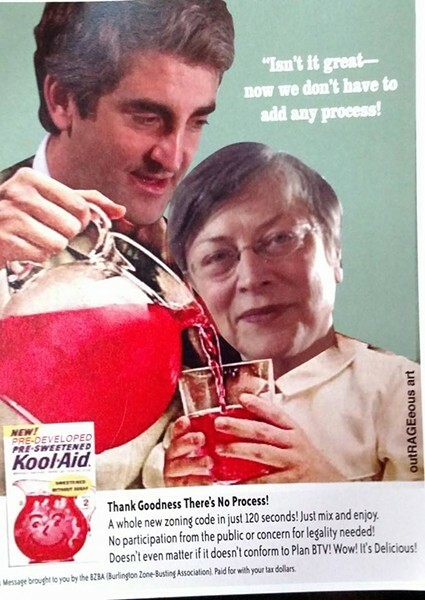 Shannon, who supported the proposal at Monday’s meeting, is portrayed in one of the ads as a child, a bow in her hair, raising a glass of Kool-Aid toward “Mother” — Weinberger. In a phone call Thursday, Shannon admitted the images are pretty funny, but she stuck by her concern that such attacks could dissuade people from running for local political office. 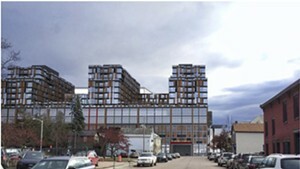 Art Hop featured another redevelopment protest when members of the Coalition for a Livable City released a two-minute video, projected on the side of a South End building, that slammed the Sinex proposal and encouraged residents to demand a public referendum on the project. 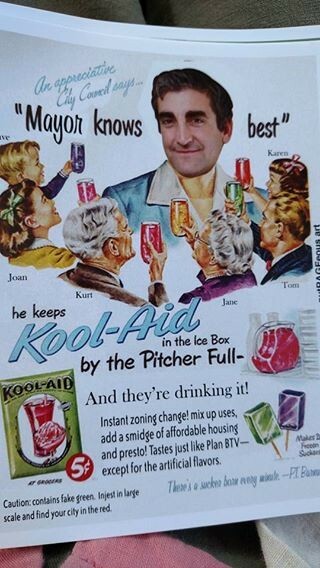 Mayor Miro Weinberger gets the Kool-Aid treatment. 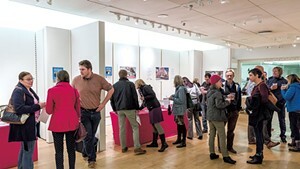 The Art Hop political protest pieces were in the same vein as those displayed at last year’s event, when a group of artists erected “Miroville,” a faux housing development and advertisement that mocked Weinberger’s proposal to allow new housing in the Pine Street Enterprise Zone. The group worried the proposal would gentrify the South End and force artists out of the area. As the artistic display went up, Weinberger changed course and pulled his support of the housing plan. The mayor’s office told Seven Days that the art installation was not directly responsible for Weinberger’s change of heart, which came after months of public objection to the housing plan. Updated, September 16, 2016 to add the statement from the mayor’s office and clarify timing of Weinberger’s decision on South End housing.